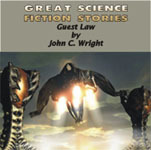 It’s been a while since we did a new release update, though we’ve been announcing quite a few on The SFFaudio Podcast. Here are a few, expect more to follow soon. I am Meredith, princess of faerie, wielder of the hands of Flesh and Blood, and at long last, I am with child–twins, fathered by my royal guard. Though my uncle, Taranis, King of Light and Illusion, claims that he is the true father since he abducted me from my home, betrayed, and defiled me. And now he has branded my guards as a threat to my unborn children. Bearing an heir has placed me halfway to my aunt’s throne, that much closer to my reign over the Unseelie Court–and well ahead of her son, my cousin Cel, in this race. Now I must stay alive to see my children born and claim my place as queen. But not all in faerie are pleased with the news, and conspirators from every court in the realm plot against me and mine. They seek to strip my guards, my lovers, from me by poisoned word or cold steel. But I still have supporters, and even friends, among the goblins and the sluagh, who will stand by me. I am Meredith Nic Essus, and those who would defy and destroy me are destined to pay a terrible price–for I am truly my father’s daughter. To protect what is mine, I will sacrifice anything–even if it means waging a great battle against my darkest enemies and making the most momentous decision ever made as princess of faerie. 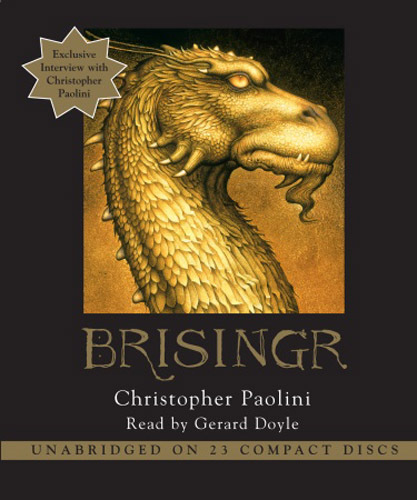 BRISINGR EXCLUSIVE: The audio edition of Brisingr features a revealing Q & A between best-selling author Christopher Paolini and editor Michelle Frey. OATHS SWORN . . . loyalties tested . . . forces collide. Following the colossal battle against the Empire’s warriors on the Burning Plains, Eragon and his dragon, Saphira, have narrowly escaped with their lives. Still there is more at hand for the Rider and his dragon, as Eragon finds himself bound by a tangle of promises he may not be able to keep. First is Eragon’s oath to his cousin Roran: to help rescue Roran’s beloved, Katrina, from King Galbatorix’s clutches. But Eragon owes his loyalty to others, too. The Varden are in desperate need of his talents and strength—as are the elves and dwarves. 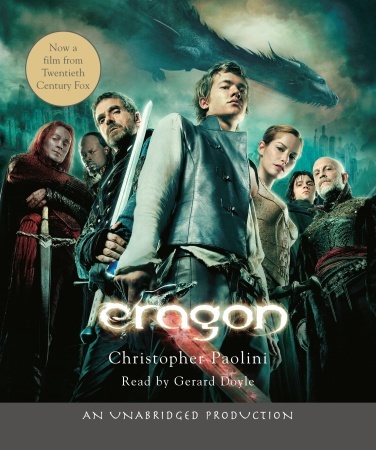 When unrest claims the rebels and danger strikes from every corner, Eragon must make choices— choices that take him across the Empire and beyond, choices that may lead to unimagined sacrifice. Eragon is the greatest hope to rid the land of tyranny. Can this once-simple farm boy unite the rebel forces and defeat the king? Jim Marlowe’s Martian pet, Willis, seems like nothing more than an adorable ball of fur with an astonishing ability to mimic the human voice. But when Jim takes the creature to academy and runs afoul of a militantly rigid headmaster, his devotion to his pet launches the young man on a death-defying trek across Mars. Accompanied by his buddy, Frank, Jim must battle the dangers of a hostile planet. But it is not only the boys’ lives that are at stake: They have discovered explosive information about a threat to the survival of the entire colony—information that may mean life or death for their families. An irresistible mix of thrilling adventure, crackling dialogue, and brilliant speculation, deftly seasoned with politics, philosophy, and a touch of the mystic, Red Planet is classic Heinlein. Note: This recording uses the author’s preferred text, restoring many cuts made by the original editor. Humanity pushed its way to the stars—and encountered the Gbaba, a ruthless alien race that nearly wiped us out. Earth and her colonies are now smoldering ruins, and the few survivors have fled to distant, Earth-like Safehold, to try to rebuild. But the Gbaba can detect the emissions of an industrial civilization, so the human rulers of Safehold have taken extraordinary measures: with mind control and hidden high technology, they’ve built a religion in which every Safeholdian believes, a religion designed to keep Safehold society medieval forever. Is a loved one missing some body parts? Are blondes becoming extinct? Is everyone at your dinner table of the same species? Humans and chimpanzees differ in only 400 genes; is that why an adult human being resembles a chimp fetus? And should that worry us? There’s a new genetic cure for drug addiction—is it worse than the disease?The audiobook also includes an interview with Crichton! 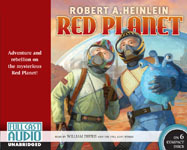 The first of a series of alternate-history tales based on a brashly entertaining premise: that in the 1960s, Russian and American space probes to Mars and Venus revealed not the arid worlds of our reality, but the colorful Mars and Venus of old pulp Science Fiction adventure. In The Sky People, it’s 1988, the Cold War is still raging, and Marc Vitrac has been assigned to Jamestown, the US Commonwealth base on Venus, near the great Venusian city of Kartahown. But all is not well. There is also a Russian base on Venus. Outside the bases is a wilderness swarming with sabertooths and dinosaurs—and lost races of people who seem to be human. An even greater mystery than lost races awaits Marc—as well as a danger that may well threaten the entire human race. An Alternate history novella that won the Theodore Sturgeon Memorial Award. This story, an alternate history masterpiece, as told from the point of view of Korolev, the “Chief” who managed the most crucial years of the secret Soviet space program, and his assistant and eventual successor, Aksyonov. The story spans from World War II, when Korolev was released from a prison camp to design rockets, to 1997 and the Mir space station. Twelve-year-old Douglas Spaulding knows Green Town, Illinois, is as vast and deep as the whole world that lies beyond. It is a pair of new tennis shoes, the first harvest of dandelions for Grandfather’s renowned intoxicant, the distant clang of the trolley bell on a hazy afternoon. Ross Jenkins, Art Mueller, and Morris Abrams are not your average high-schools students. While other kids are cruising around in their cars or playing ball, this trio, known as the Galileo Club, is experimenting with rocket fuels, preparing for their future education at technical colleges. Art’s uncle, the nuclear physicist Dr. Donald Cargraves, offers them the opportunity of a lifetime: to construct and crew a rocket that will take them to the moon. Cargraves believes their combined ingenuity and enthusiasm can actually make this dream come true. But there are those who don’t share their dream and who will stop at nothing to keep their rocket grounded. Daniel Feldman was a doctor once. He made the mistake of saving a friend’s life in violation of Medical Lobby rules. Now, he’s a pariah, shunned by all, forbidden to touch another patient. But things are more loose on Mars. There, Doc Feldman is welcomed by the colonists, even as he’s hunted by the authorities. But, when he discovers a Martian plague may soon wipe out humanity on two planets, the authorities begin hunting him for a different reason altogether. Alan Green is a space traveler stranded on a barbaric planet. He’s been taken as a slave and made a consort to an insipid and smelly queen. His slave-wife, though beautiful and smart, nags him constantly. He’s given up hope of ever returning to Earth when he hears of two astronauts who have been captured in a kingdom on the other side of the planet, and sets out on an action-packed journey on a ship sailing across vast grasslands on rolling pin-like wheels in a desperate scheme to save them and return home.